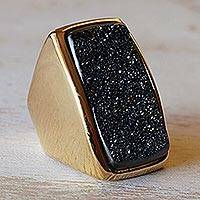 So What is a Druzy Anyway? 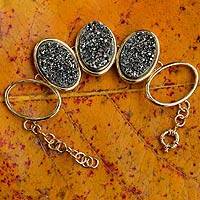 A druzy (pronounced droo-zee) is a fine crystalline textured stone. Druzy crystals are most readily found inside hollow geodes. The crystals can be made of macro-quartzes, such as amethyst or micro-quartzes such as agate. The agate druzy is a substance that can be dyed in different colors. 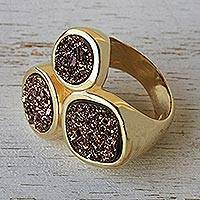 Slices of small geodes are often used in druzy jewelry displaying a ring shape with druzy coating the inside of the hole. Solid druzy coated stones are usually cut down and polished from geodes that are too large for hollow slabs or cut down to remove imperfections. 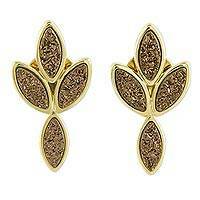 Is it spelled druzy or drusy? 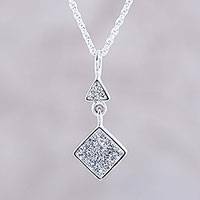 The term druse is an actual minerological reference to the natural phenopmena of crystal coating. 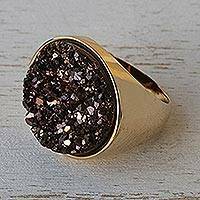 So the term drusy, would be more correct in scientific terminolgy, but for popular retail terms, druzy seems to have taken over. 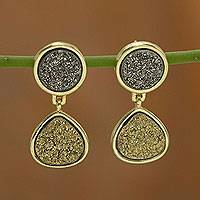 However, jewelers such as Zales and designers such as Kendra Scott still prefer the original term drusy. Who came up with the name druzy? 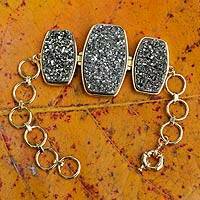 The word druzy is a modern twist from the minerological term for druse. 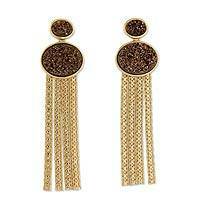 The original word came from German word, druse, meaning "weathered ore". What are druzies made out of? True druse is silica deposited by water that made its way into a stone. Most druzy stones are the hollow parts of geodes. 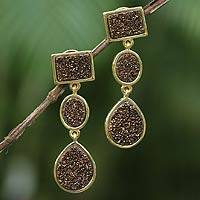 The host material for druse can vary from regular stones such as sandstone, all the way to precisous gems like ruby our tourmaline. 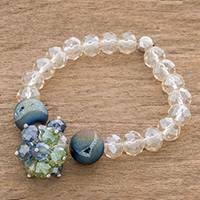 Most druzy stones are made from quartz crystal. 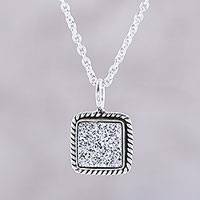 Many druzies are created by polishing a slab or material to show of its rough druzied edging. This is especially true of amethyst, which is naturally purple in color. 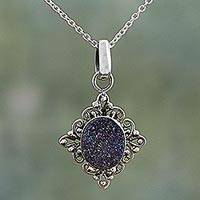 Many colored druzy stones get their colors from addded metals. So can ANY gemstone can become a druzy? It sure seems like it. Due to the natural layering of the Earth's elements, the range of possibilities in natural druzy crystals and geodes are neverending. There seems to be two types of druzy, crystalline edges of macro-quartzes such as amethyst, and finer snow like crystal coatings of true druse on a contrasting mineral or gemstone such as sandstone. 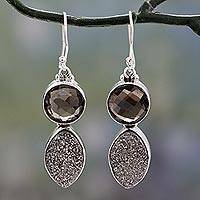 Gems, minerals and stones that can have druzy coatings include: pyrite, hematite, any quartzes, garnet, dolomite, azurite, chrysocolla, turquoise, calcite, and vanadinite. Druzies that aren't in the quartz family are more rare. 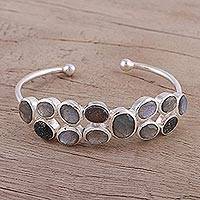 Are there fake druzy stones? Yes. Imitation druzy stones can be created by glueing chunks of broken crystals together with resin or by painting over lower quality faceted surfaces. Not all imitation druzies are bad. 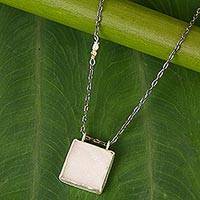 Some are their own type of product created out of a desire to not let gemstone materials go to waste. Another reason for imitaion druzies are simply to experiment with the effects diferent coating can give a natural quartz crystal. 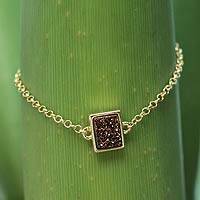 The creation of gemstone druzies such as tourmaline or ruby, can actually be considered its own type of druzy if the material used is a highly sought after gemstone on its own. 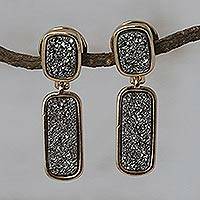 Titanium druzies are regular quartz druzy crystals that are coated in the metal titanium, which has a bright metallic silvery finish that can be colored or mixed with other metals to change its effect. What is a Paraiba Druzy? Paraiba is a named given to tourmalines with bright aqua blue coloring mined in Brazil. A crystalline form of this stone is called a druzy, so Paraiba druzies are druzies made from Paraiba stones. I am uncertain whether or not they are naturally crystalline or just fused pieces of broken stones. Are there other types of created druzies besides titanium? Angel aura quartz is when quartz is fused with platinum or silver metals. It has an iridescnet rainbow coloring to it. Apple aura gets its green from nickel. 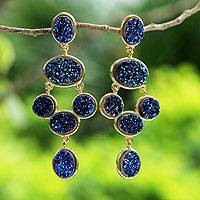 Aqua aura crystals are blue in color from a coating or fusion of gold. Champagne aura quartz gets its coloring from either a gold-indium mix or gold-iron mix. Cobalt infused quartz gives off a cobalt blue type of color. Copper makes the crystals orange. Flame auras are from a titanium-nobium mix and are a rainbow iridescent color. Indium coating gives the crystal a violet color. Indigo aura is from gold and iridium. Opal aura looks like opal because of iridescence added to clear quartz. It gets its coloring from platinum. 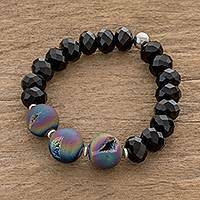 Rainbow quartz is created by the fusion of quartz, titanium and gold together. Rose or Ruby aura quartzes, unlike natural rose quartz, is clear quartz infused with platinum and a little bit of gold or silver. Depending on the mix, the coloring can go from rose to bright ruby. Sunshine aura is yellow colored from platinum and gold added. Tangerine Aura Quartz is colored from a mix of gold and iron infusion. Tanzine Aura Quartz, ak tanzanite aura gets its blue violet tones from a gold-indium mix and sometimes has nobium added. It is mistakenly refered to with the term tanzanite because real tanzanite has purple violet coloring. 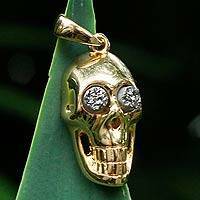 Here is an interesting video of how an artist can create pendants and other jewelry using crystals and drusy crystals.